Most bookmarks simply won't do. They let you know roughly which page you are on (but is it the left page or the right? ), yet they don't tell you which line you stopped at. Here I will describe how to construct, out of ordinary household materials, an isomorphic bookmark which uniquely identifies the line on which you stopped reading. 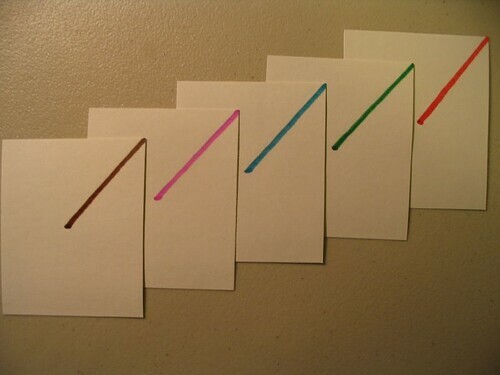 The isometric bookmark has the following property: For any line L on page P, there exists an orientation θ that uniquely identifies L on P.
In other words, by turning the card you can have it point at any line on any page – left-facing or right-facing, near the top, middle, or bottom, as shown below. Fig. 2. 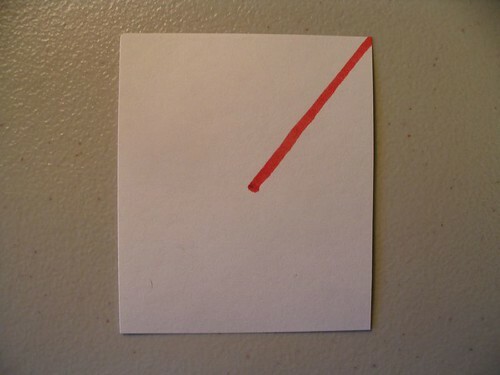 Bookmarking a line near the top of a left-facing page. 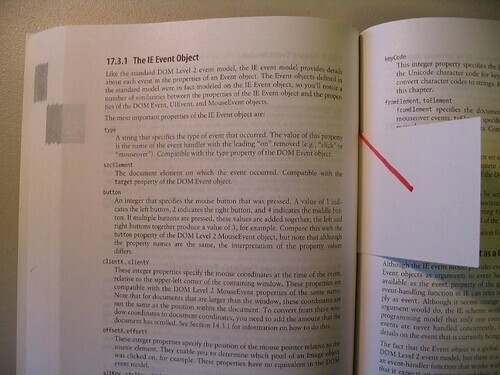 There are line-based bookmarks like LastLine that you can buy at bookstores, but it's hard to beat the isomorphic bookmark for simplicity, cost, and structure-preserving topological invariance. posted by Jonathan at 7/09/2007 09:00:00 p.m. Excellent - I thought I was the only one dealing with this problem! I always stop reading at the top of a page. So I don't need it for that. But I fold the /bottom/ corners of pages for things I want to look into later. When I do that I make a bigger or smaller corner to give myself an indication of where on the page the thing I am going to investigate is. By Thomas David Baker, at 7/10/2007 5:30 p.m.
Neat stuff Tom - scale-preserving contextual corners! By Jonathan, at 7/10/2007 5:36 p.m. I loved reading this post! It's a wonderfully low-tech solution to a problem I thought about here. I'm definitely going to try it out. By Sean O'Hagan, at 7/18/2007 7:02 p.m.
Sean - great! iirc you're a math guy right? Also I've been finding that it's best not to cut the index card - it makes the bookmark too small (hard to find). By Jonathan, at 7/18/2007 11:38 p.m.
By sys.out, at 7/20/2007 12:10 a.m.
Hi Michele - My pleasure! And be sure to try leaving the index card uncut, so it's easier to find. By Jonathan, at 7/20/2007 12:15 p.m.
these post-it notes are great. point it at the word you left off on. also, they don't fall out of the book. By tim, at 7/20/2007 1:58 p.m.
By Jonathan, at 7/20/2007 3:55 p.m.